Charlton slumped to their seventh defeat in nine league games with defeat at home by Brentford, prompting the Addicks to dismiss coach Guy Luzon. John Swift opened the scoring for the visitors with a 26th-minute header and Alan Judge's delightful curling effort on 55 minutes made it 2-0. 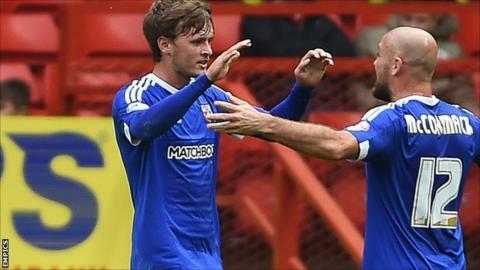 Substitute Lasse Vibe added a third five minutes from time to lift Brentford up to 12th in the league. It was Lee Carsley's third win on the bounce after taking charge last month. Franck Moussa had a great chance for Charlton after just four minutes but the unmarked Belgian was off target from 10 yards after a nice cross from Tony Watt. Brentford opened the scoring after the lively Judge added another assist to his tally as he whipped in an inviting cross from the right and Swift all too easily planted his header beyond Stephen Henderson. Alan McCormack's pile-driver from 25 yards then smacked the crossbar after he was teed up by Marco Djuricin. After the break Judge added a second when he advanced to the edge of the box and clipped a lovely effort into the top corner. Charlton were all out of fight and Vibe sealed victory when he latched on to Judge's inch-perfect pass and beat Henderson at the near post. "It's not a first time manager's role. It's not a see how you get on, it's a big job with a forward thinking club potentially going to the Premier League. I don't feel I am the right person for that. "I thought we performed better at Wolves. At Wolves we controlled the game from start to finish but I didn't think we did that today. "I thought we rode our luck in the first 20 minutes. It was important not to give Charlton any lifts and we did that for the first 20 minutes. "The way we took our chances, the way we pressured them, we won the ball back quickly, we did all the basics well." Match ends, Charlton Athletic 0, Brentford 3. Second Half ends, Charlton Athletic 0, Brentford 3. Attempt saved. Conor McAleny (Charlton Athletic) right footed shot from the left side of the box is saved in the centre of the goal. Assisted by Karlan Ahearne-Grant. Attempt saved. Johann Berg Gudmundsson (Charlton Athletic) left footed shot from outside the box is saved in the centre of the goal. Assisted by Johnnie Jackson. Attempt blocked. Alan Judge (Brentford) left footed shot from outside the box is blocked. Assisted by Lasse Vibe. Attempt missed. Harlee Dean (Brentford) header from the right side of the box is close, but misses to the right. Assisted by Alan Judge with a cross following a set piece situation. Substitution, Brentford. Sergi Canos replaces Alan McCormack. Goal! Charlton Athletic 0, Brentford 3. Lasse Vibe (Brentford) right footed shot from the left side of the box to the bottom left corner. Assisted by Alan Judge following a fast break. Attempt missed. Johann Berg Gudmundsson (Charlton Athletic) left footed shot from outside the box is just a bit too high. Assisted by Conor McAleny. Conor McAleny (Charlton Athletic) is shown the yellow card for a bad foul. Attempt missed. Karlan Ahearne-Grant (Charlton Athletic) right footed shot from outside the box is too high. Substitution, Charlton Athletic. Karlan Ahearne-Grant replaces Tony Watt. Offside, Charlton Athletic. Johnnie Jackson tries a through ball, but Reza Ghoochannejhad is caught offside. Corner, Brentford. Conceded by Patrick Bauer. Toumani Diagouraga (Brentford) wins a free kick in the attacking half. Offside, Charlton Athletic. Johann Berg Gudmundsson tries a through ball, but Reza Ghoochannejhad is caught offside. Attempt saved. Conor McAleny (Charlton Athletic) right footed shot from outside the box is saved in the centre of the goal. Attempt blocked. Chris Solly (Charlton Athletic) right footed shot from the right side of the box is blocked. Assisted by Johann Berg Gudmundsson. Attempt saved. Conor McAleny (Charlton Athletic) right footed shot from the left side of the box is saved in the bottom right corner. Assisted by Reza Ghoochannejhad. Offside, Brentford. Ryan Woods tries a through ball, but Marco Djuricin is caught offside. Substitution, Brentford. Konstantin Kerschbaumer replaces John Swift. Hand ball by Conor McAleny (Charlton Athletic). Substitution, Charlton Athletic. Conor McAleny replaces Franck Moussa.